LEASED! - Come Home to Gorgeous! - $2,695,000! 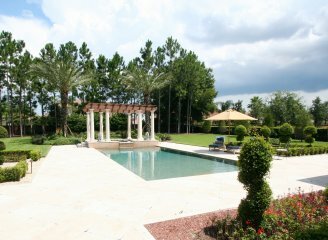 Windermere-Orlando: Life is beautiful in this stunning Mediterranean residence - beautifully furnished - on almost 1 Acre in a desirable gated community only 15 minutes to everything! 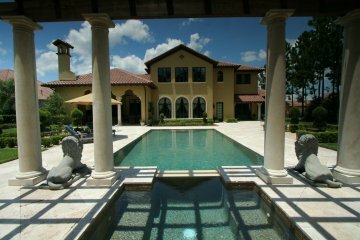 Move right in and start living in this beautiful Florida home! 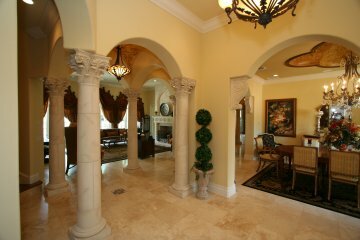 Upon entering this exclusive community you are greeted by an impressive gated entrace with a full-time guard on duty. The home boasts 6559 square feet heated and cooled (8707 under roof), is custom designed and built for the current owner. 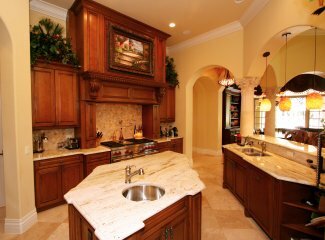 It exhibits fine craftsmanship, a very spacious floor plan with gleaming marble floors, open rooms defined by stately Corinthian columns under soaring ceilings and graceful arches. A spectacular view of the rear resort-style setting, seen through enormous Cathedral windows dressed in silks, is exciting and features a dramatic pavilion with lion-head fountains splashing into a heated pool for year-round enjoyment and a heated spa. The pool is large and is surrounded by a grand entertainment terrace, flanked by formal geometric gardens and seating areas framed by manicured boxwoods! Truly a delightful sight! 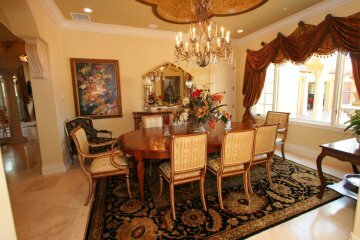 The floor plan of this two-story residence offers a 23’ living room, 19’ dining room with hand-painted ceiling and exquisite chandelier, a well-designed Kitchen with furniture-quality cabinetry topped with granite and a 10’ snack/serving bar opening to a 22’ family room. The breakfast area overlooks the rear pavilion/pool area – a beautiful view! 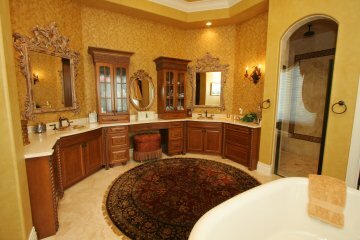 The master suite and study are accessed from a private hallway. A lovely guest suite is situated on the opposite side of the floor plan to ensure privacy. 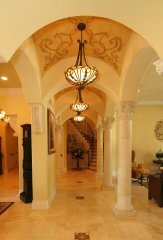 A wide marble hallway, framed in Corinthian columns and arches leads to an iron-banded staircase under a rotunda hand-painted ceiling which gracefully winds upward to a balcony with a small study/computer area, a fabulous 23’ bonus room with entertainment center (great for children!) and three additional bedroom suites each with private bath. 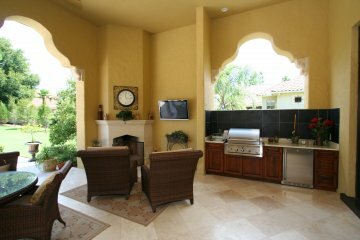 Outdoor living is enhanced by a large, covered living/dining area, complete with a Summer kitchen overlooking the pavilion/pool area - and is just perfect for entertaining. The lot is approximately 1 Acre and if you have small children – there is room for a playground – away from the pavilion/pool area! 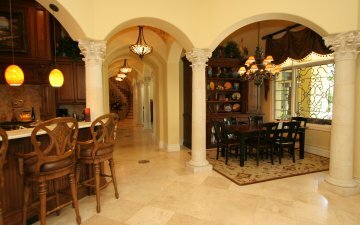 The home was completed in 2006, and custom built for the current owner. The lay-out will adapt to many family formations. There is a 4-car garage and security system. 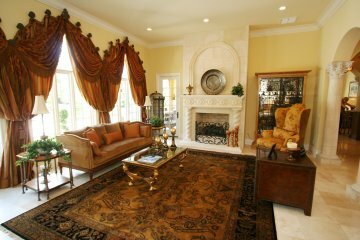 Come home to beautiful and start enjoying the benefits of the owner's custom touches and extraordinary design!